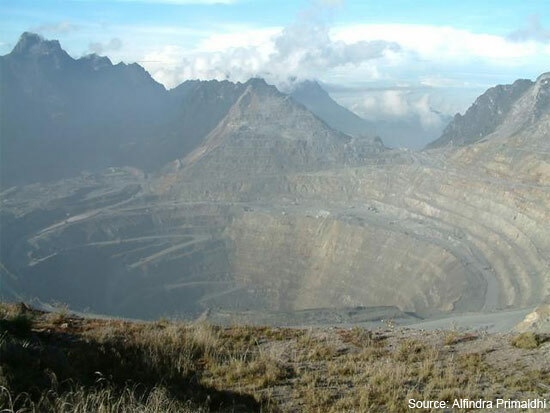 Located some 60 miles north of Timika, at Tembagapura in Irian Jaya – the most easterly of Indonesia's provinces – on the western half of the island of New Guinea, the Grasberg mine has the world's single largest known gold reserve and the second largest copper reserves. The Grasberg Open Pit – originally a 4,100m-high mountain, which has been mined down to 3,000m. Copper is the primary commodity, with a proven and provable reserve of 2.8 billion tonnes of 1.09%. The reserves also contains 0.98g/t gold and 3.87g/t silver. RANAI, Indonesia, Aug 26 (Reuters) - The word "sleepy" could have been invented for Ranai, the largest town in Indonesia's remote and sparsely populated Natuna archipelago. It has few cars and only two sets of traffic lights. The cloud-wreathed mountain looming over it resembles a slumbering volcano. Nearby beaches lie pristine and empty, waiting for tourists. The voices of local workers in the world’s largest gold and copper mine controlled by the US-based mining giant Freeport McMoRan in Papua can be heard loud and clear in a new documentary that chronicles the biggest strike in the company’s history. Transparency and accountability are universally accepted as the cornerstones of good governance. With neither present in Papua, we can be sure that the natural riches of the region will never come to benefit local communities, but will rather bring about the so-called “resource curse” in the form of economic, cultural, social and political strife and ecological disaster. Activists were pessimistic that the government plan to allocate 45 percent of forests in Kalimantan as “the lungs of the world” would work, as mining activities and land clearing for oil palm plantations had taken up more than half of the forests on the island. The recent Durban climate talks had mixed results and different implications for each country, including Indonesia. On the main issue of reducing emissions from deforestation and peat land conversion, known as REDD, Durban made progress in setting reference emissions levels, measuring emission reductions (including agreements on measuring), reporting and verifying (MRV) of achieved REDD+ outcomes, and the implementation of safeguards to mitigate negative impacts of REDD+ projects. Thousands of protesters staging a rally in front of the Bima regent’s office over the handling of a recent deadly clash at Sape port on Sumbawa Island, West Nusa Tenggara (NTB), ran amok and set fire the building on Thursday.